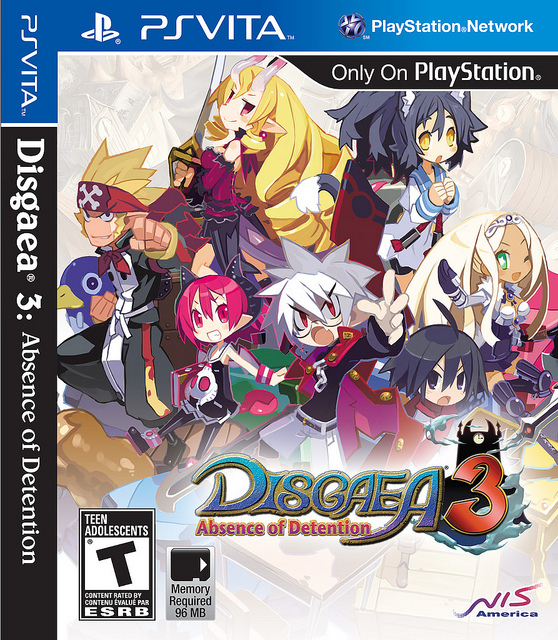 Though I am in no way new to the SRPG genre, I’ve always been hesitant when it came to the Disgaea series. It was always something about the geo blocks and quirkiness that I found off-putting in comparison to what I’d already become familiar. Titles like Tactics Ogre and Advance Wars (Gameboy Advance) were pretty straight forward yet highly satisfying. What business did I have screwing with that formula? If that wasn’t enough, games are expensive and even used Disgaea games carried a steep entry fee. If that says anything about the quality of the product, it’s that this series might actually be worth the investment. So now that Disgaea 3: Absence of Detention has arrived on the PS Vita; I’ve taken it upon myself to enroll in the Evil Academy. The following is a review of what I’ve experienced on campus. So, I’m not sure if anyone emphasized the importance of attendance or punctuality but I’m finding it strange students and teachers alike aren’t showing any effort. What makes things even stranger is that even though I’ve shown up to all my classes, somehow I find myself sitting in detention like some delinquent. While trying to figure what I did wrong, I couldn’t help but notice these three girls talking. Well, Raspberyl was doing most of the talking while Kyoko and Asuka listened. She went on and about this student named Mao that never goes to class, has bad manners and for some reason is considered the number one honor student. I thought to myself: “His father must be the Dean!” As it turns out, that’s actually the truth! However, Mao isn’t the number one honor student due to his father’s influence; it’s actually his negative behavior. It turns out that students that go to class are delinquents at Evil Academy. Those that behave questionably like Mao make the honor roll. She went on to explain that Mao is having a change of heart in order to defeat his father for destroying his video games and all of his save data. If anything, it sounds like this kid needs a hug. While the campus definitely has a traditional design, I couldn’t help but feel as though things were a bit dated. Don’t ask me why but I imagined myself examining things from a 5 inch OLED screen. From a safe distance everything looks vibrant but it’s when you get up close and personal that things begin to look pixilated. This is in sharp contrast to some of the conversations I’ve eavesdropped upon. In those instances I was treated to the most vibrant anime inspired incarnations of my fellow Evil Academy classmates. It’s also during these interactions that I can enjoy their unique personalities. Hearing their voices as opposed to just reading lips (text) has made my experience here that much more enriching. While patrolling the halls and such, I find it a treat hearing the tunes played through the PA system. I suppose it can become a bit repetitive for some but whoever is behind the boards is doing a good job of reflecting the mood. When a fight is about to go down or when Mao and Almaz discuss matters of the heart, there always appears to be an appropriate number that sets the tone. Once you get familiarized with the campus you’ll see that it’s pretty easy to find what you’re looking for. The staff outside of the classroom appears to be dedicated to making sure we do just that, stay out of the classroom. I guess that’s just one more Netherworld quirk I’ll have to get accustomed to. In any case, finding the respective personnel for weapons, armor, evilities (abilities) and so forth are made simple by visual cues. That simplicity is gone out the window however once you begin to navigate the items and options within the menus. It takes some getting used to but it’s not long before you get the hang of it. Once you’re well versed then you’ll be better suited for the real Evil Academy curriculum, fighting. Winning fights won’t always be a matter of strength, strategy is the key component here and it’s only by paying attention to the tutorials that you’ll succeed. The relationships that you develop in the classroom and in clubs are reflected during battle so it pays to put yourself out there. Even something as simple as seating arrangement can help determine the effect (or lack thereof) of certain team attacks. Still it pays to experiment because team attacks not only inflict heavy damage, they’re also a joy to observe. Do I Recommend You Enroll? In my time at the Evil Academy I must say the pluses certainly outweigh the minuses. One of the biggest issues I’ve had is the fact that some of these kids just love to hear themselves talk. Disgaea 3 does a great job capturing that anime/manga essence but in the process it also includes the filler. Nevertheless, the content in this tiny card is enough to keep you happy long after you’ve completed the main story. Aside from the PS3 DLC there are a number of additions to the mix such as bosses, item customization, super moves and a new form of magic. Very unique to this iteration of Disgaea are the touch and online capabilities. While I tried to like using the rear touchpad, in the end I turned it off in the settings menu. Its purpose is to zoom in and out and/or cycle units but too often I found myself doing something I didn’t mean to. Here and there I’ll turn it back on just to get a better view of a new area but then its right back off. If not for selecting a save file the touchscreen would be pointless by the way. It would’ve been a nice uh… touch to be able move units and select actions with a finger, maybe in the future. For now you’re only allowed to prod the characters here and there. PSN integration allows users from around the world to keep tabs on a grocery list of milestones and in-game activities. Also, with GPS enabled Vitas it’s possible to earn bonuses in relation to distance traveled in the real world. All in all this is a solid effort from NIS America and without a doubt the best SRPG for the Vita. (Shut up, they may not know it’s also the only SRPG!) My time at the Evil Academy has opened my eyes as to my status as a delinquent. No more! There’s no need for me to proofread my reviews and who cares if this is a week late. They ought to be glad I even bothered dood! See you all next semester! + All the content the PS3 version offered plus more! + Deep strategy and gameplay features. + Countless hours of replay value. + Humorous storyline, quirky characters. – Conversations tend to be on the lengthy side. – Touch controls were clearly an afterthought.